As a mother, I feel the pain that my child feels- whether it is a simple toothache or a high fever where he is feeling uncomfortable. It breaks my heart to see my son suffer from pain and sickness. If it's possible for me to take all the pain away from him, I will. 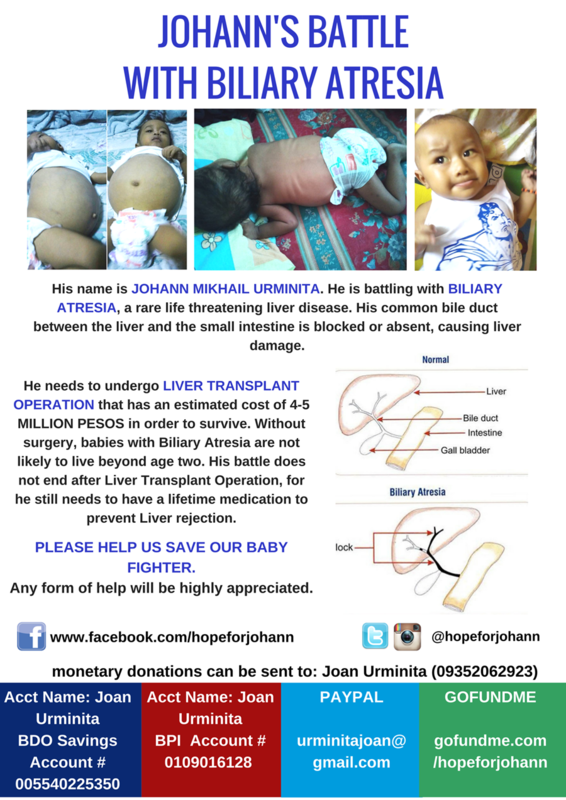 Since I'm talking about pain and suffering here, I would like to ask you to read this blog post for a minute and let's help and save baby Johann. Joan Urminita emailed me asking for help. She is a single mother residing in Cainta, Rizal and is knocking in your kind hearts to help raise funds to save the life of her baby with life threatening Liver disease. After seeing the photo of baby Johann, I was teary-eyed. My heart is melting while writing this post. I know how it feels to have a family member who is seriously ill.
You don't need to oblige yourself to donate a big amount of money, whatever is in your heart it will mean a lot to Joan and baby Johann. You can share this blog post so that it will reach a lot of people.